This is the building found across from the red brick Borden building at U of T which I showed you last week. This is 1 Spadina Cres and is found in the centre of a roundabout of Spadina Ave just north of College St. 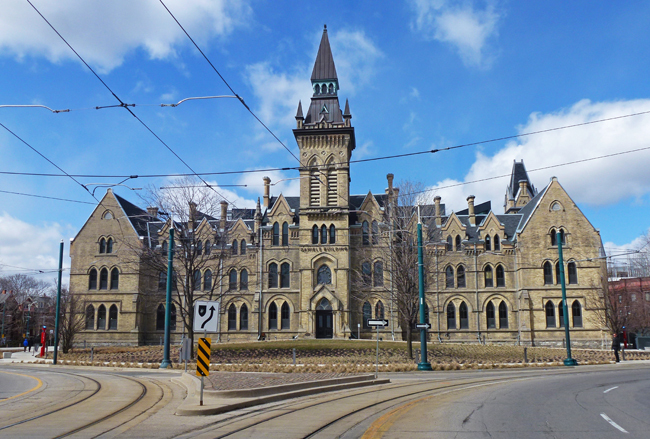 It was built in 1875 as Knox College which was a Presbyterian theological school, then became a military hospital during WWI, then had various government uses until being purchased by U of T in the 1970s. The university used it for various office spaces and then for the visual arts program until a major renovation proposal was unveiled in 2013. This is now the John H Daniels Faculty of Architecture, Landscape & Design and the new use was opened in late 2017 although during a recent wander I found a lot of construction still going on inside. I will show you the wonderful modern addition on the north side over the next two days. Surprise, surprise. I was riding the streetcar past here last Sunday. Good thing you took the picture this time of year. When the trees have their leaves it blocks some of the view. As you might have guessed, this gorgeous stone structure sends me into spasms of joy! Well, that's a bit of an exaggeration, but you know what I mean. It's huge, it's stone, it's being used for good purposes - what more can one ask for? (Yes, I know that sentence contains a dangling whatever, but I just don't care this morning.) Heh, heh. Hope you have a wonderful day! It is beautiful, and you had a beautiful day to photograph it! It certainly is a beautiful building. Terrible events there yesterday- I've seen a comment from you this morning, so I know you're safe. What a pleasure to see, know a bit about, and anticipate your next views, Pat! Such a beautiful old building. It's so good to know that it is still being used and enjoyed. What a very appropriate use for this incredible building, which is an incredible piece of architecture itself. P.s. I'm so relieved to see you here Pat. Got such a shock when we heard the news this morning. Honestly what a state the world is in! This is quite a structure. Not something I see here in my small town. A beauty of a building and it's made of stone, the best. Heard about the terrible event that took place yesterday, glad you are safe. It certainly is a beautiful building! Such stone and strength it has!